Serve warm or cooled, as a side at breakfast, as an appetizer with garnishes or melted cheese on top, with soup, or as a dessert with orange marmalade, honey or molasses. We like them sprinkled with grated Parmesan cheese and/or bits of sautéed Chorizo sausage. I cook the fritters on a teflon-coated griddle. 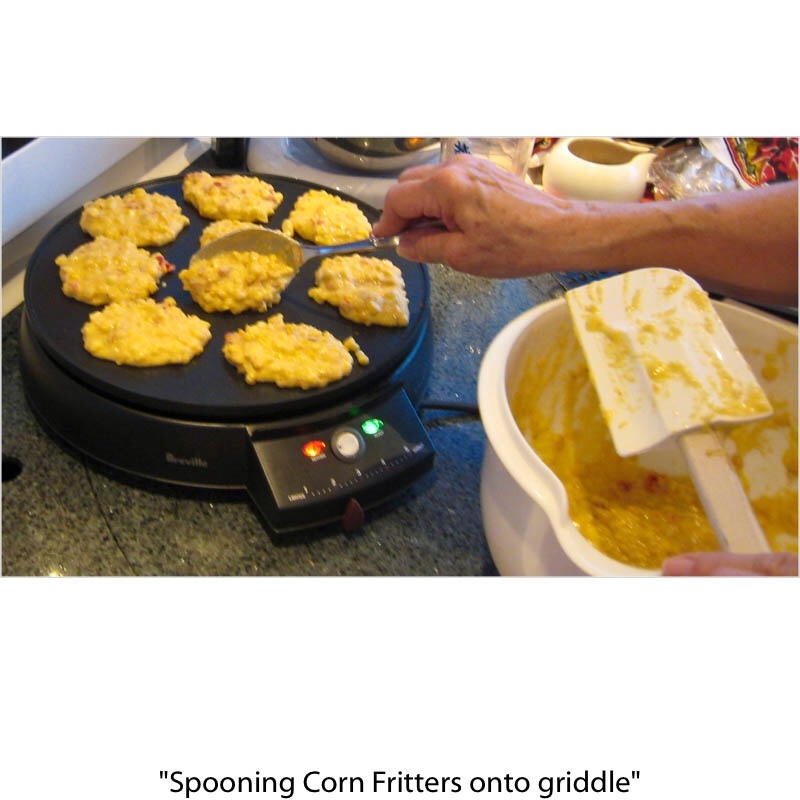 If you cook them on a griddle or skillet that is not teflon, coat the pan with oil before cooking the fritters. I am using fresh corn, but I am sure that defrosted frozen corn kernels would work well, too. I prefer the sun-dried tomatoes that are marinated in oil. I like to use some of the oil from the sun-dried tomatoes marinade in the fritters. Heat 3 tablespoons of the oil in a medium skillet or Wok. Add the corn, sun-dried tomatoes, and 1/2 teaspoon of the salt. Cook and toss the mixture over medium-high heat until heated and well-mixed, about 3 to 4 minutes. Spread the corn onto a plate to cool slightly. In a medium bowl, whisk together the cornmeal, flour, sugar, baking powder, and remaining 1/4 teaspoon of salt. Stir together the buttermilk, eggs and remaining oil. Add to the dry ingredients and stir until blended. Add the corn mixture and stir until just combined. Heat a griddle to medium-high. Drop large spoon-fulls of the mixture onto the griddle, turn the temperature down to medium, and cook for 3 minutes. Turn over and cook for 3 minutes. Remove from griddle onto a plate.